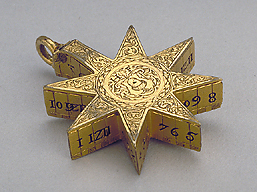 This polyhedral dial, in the form of an eight-pointed star, has the hour lines engraved on the facets between the points. It can be adjusted for latitude by means of a hinged strut, and has a small compass, pivoted so that it remains horizontal. The initials 'H F' and an acorn appear on the top of the box, and it has been suggested that the maker was Hans Felt. A similar dial can be found in the collection of the Museum of the History of Science in Oxford (Epact 54651).